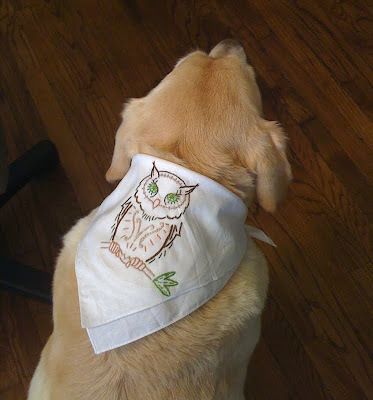 Jessica made this sweet owl bandanna for her pup, who is looking quite dashing, no? I've said it before: teaching hand embroidery classes is one of my very favorite things to do. And one of my favorite parts of teaching is seeing all the cool stuff people make after they leave my class. I love seeing people get as inspired and excited as I am about embroidery, and leaves class ready to take on more projects. I've been incredibly fortunate to have the nicest, most enthusiastic students at the Stitch Lab here in Austin. And I love to be able to brag on them when they send pictures of some of the things they've been making. 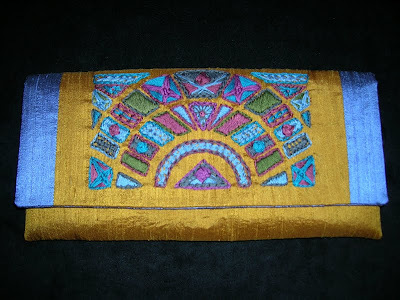 Jean used one of my very favorite embroidery books to inspire the stitches in this gorgeous embroidered handbag. Lovely! So as you peruse the fine work of my students in this post, I'd like to let you know that there are a few opportunities to get in on the embroidery class action coming up. If you'd like a tiny taste of the class, head on over to Parts & Labour on Thursday, August 27 from 6-9 PM. 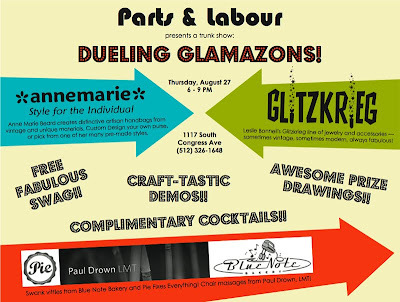 My pals, Leslie Bonnell and Anne Marie Beard will be hosting a fan-freaking-tastic trunk show called Dueling Glamazons. These ladies make some insanely awesome jewelry and handbags, and they'll be rocking out at P&L on Thursday. 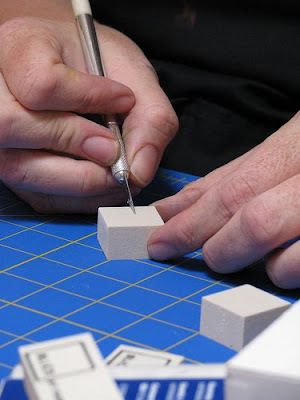 Kat's skillful hands carve a stamp in our Surface Design class. As part of the event, there will be a handful of crafty demos going on. The amazing Kat McTee (whom I've fawned over again and again) will be on hand to show how to carve simple stamps. Carol, Stitch Lab Studio Assistant Extraordinaire, will be getting folks hooked on crochet (puns, FTW!). Finally, little ole me will be there showing some basic hand embroidery stitches and sharing my general love for the craft. 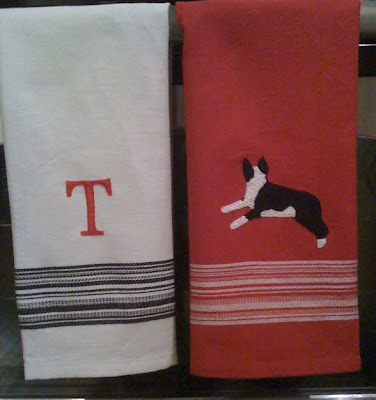 After mastering her dog's dapper wear, Jessica went on to stitch these adorable tea towels for a friend! But here's the thing: embroidery has genuinely changed my life. No jokin'! And if I can send some of that happiness and fun creative time out to other folks, then honey - step outta the way, 'cause I'm gonna do it. So! If I've convinced you to take a class, skedattle on over to the Stitch Lab site and sign up. I'll be promoting upcoming classes at the event on Thursday, so they'll be filling up soon. Grab a spot before they're gone! 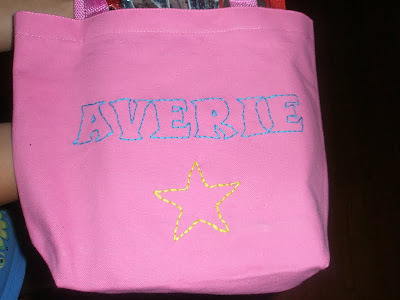 Believe it or not, this sweet tote was stitched by an eight-year-old girl! She took my mother/child embroidery class back in May, and her mom reports that she's been stitching like crazy ever since. She made this totebag as a birthday gift for a friend. I found this needlepoint piece at the Cathedral of Junk here in Austin (more on that below). I was immediately drawn to him because - obviously - he's a form of needlework, and because he was strangely pristine in the environment. I've always been a little creeped out by clowns, but something about this guy makes me really like him. Maybe it falls into the same category as "so ugly, it's cute" ... he's "so creepy, he's cool." * The Cathedral of Junk is a fantastic backyard "playscape" of junk here in Austin. You can read more about it here. The kids and I went for the first time a couple of weeks ago, and could have spent hours there if it hadn't been so insanely hot and humid that day. I plan to go back in the fall when we can explore even longer. Here are a few more pictures from the Cathedral of Junk. If you are ever in Austin, you *must* visit it!